Once you learn the beauty of roasting your own chickens you'll never be able to pick up one from the supermarket again - it's just too easy (and fills the apartment up with such delicious smells!) It may not be done on a rotisserie (although I'd LOVE for someone to try that in my kitchen... when I'm not there...), but it's incredibly easy, and great if you have guests. Just pop it in for about an hour and you have plenty of time to chat and drink wine with your friends! Plus, you'll look like an A plus chef without trying very hard. I say this because tonight Sam did the chicken! I was going to my very first real cooking class and wasn't going to get home in time to do much of any cooking, so Sam took it on! And as you might be wondering, I actually didn't do any actual cooking in the cooking class, but I did learn the proper technique to use when cutting up an onion (apparently, you do not chop it!) I came home with some pretty sweet knives - safest I've ever felt walking home, by the way - and was hit with the delicious aromas of home cooking a la Sam. 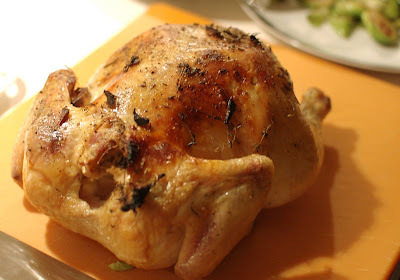 This is really the simplest Roast Chicken Recipe, as it uses stale bread as the "roasting pan" which then doubles as tasty croutons as well! I think I found it in the NYTimes, but if anyone knows where it's actually from, please let me know so I can give them credit! Incidentally, by cooking this tonight, I found out that I'm in dire need of the second knife skills class, in which you learn, among other things, how to carve a chicken. Wash and pat dry the chicken, including the inside. Sprinkle the inside and outside with salt & pepper and drizzle a bit of olive oil on the outside. Stuff the garlic, thyme, and lemon into the chicken and place it in a pan directly on the slices of bread. Cook for about 1 hour and 20 minutes (this will vary depending on the size of the chicken, but the inside temperature should register 180 degrees when the chicken is ready.) Serve the chicken with or without the croutons (but I really recommend trying them!) You'll have leftovers, but they're perfect for an end of the week dinner salad. I just found your website and think it is a great idea. Although I have a full kitchen now I lived in NYC for 10 years with a hobbit kitchen and after reading your blog wished I had been more creative. I can't wait to see more recipes and adventures! Your recipes are also great for the environmentally conscious since if you can make it in a toaster oven it uses a lot less energy then a larger one! Thank you.